Did you know that their are a handful of PGA Tour golfers who have slept with their caddies? It's true and the list includes the last two winners of The Masters, though, neither player slept with the caddie they used when they won The Masters. All of the players on the list below have readily admitted to sleeping with their caddies and they are all proud of the fact. And these are all very well known PGA Tour players who have collectively won 33 PGA Tour events as well as 19 European Tour events and the five players combined have won almost 100 golf tournaments around the world including the last two Masters. If you are a golf fan you know that PGA Tour players make a lot of money and PGA caddies can also make a lot of money. Check out How Much Money Do PGA Golf Caddies Earn? to see just how much caddies do actually make. Hope you like the list below and are not too shocked about it. Justine Reed was on the bag for her husband Patrick Reed's first five wins on the PGA Tour. Justine has since given birth to the couple's daughter Windsor-Wells. Justine's brother, Kessler Karain has taken over as Patrick Reed's caddie and he was on the bag for his brother-in-law Reed's first major win at the 2018 Masters. In 2013, Sergio Garcia won the Thailand Golf Championship on the Asian Tour with his then girlfriend Katharina Boehm on the bag. That win was not some kind of publicity stunt as Katharina Boehm played golf on scholarship at the College of Charleston so she knows her way around a golf course. Sergio Garcia is now married to Angela Akins and the couple have a daughter named Azalea who was named for the 13th hole at Augusta National after Sergio won his first golf major there in 2017. Thomas Aiken has a very pretty wife named Kate and she has caddied for her husband many times. 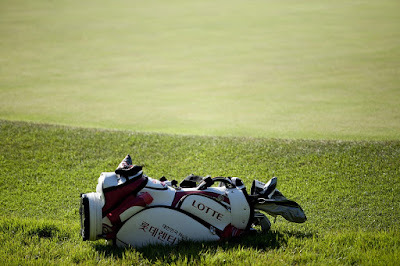 In 2014, Kate was on the bag when Thomas Aiken won the Africa Open on the European Tour. Steve Stricker's wife Nicki Stricker, caddied for him full-time from 1994-1997, and on a few other occasions since in PGA Tour events including at the Greenbrier in 2014. Amber Watney caddied for her husband on the PGA Tour at the CIMB Classic a few years ago when Nick Watney's regular caddie got sick. Nick Watney's cousin is Heidi Watney who used to cover the Boston Red Sox for NESN but now works for MLB Network. Heidi has never caddied for her cousin but she was rumored to have had affairs with Red Sox players like Jason Varitek and Nick Green while she covered the team. All five players listed above slept with their caddies who caddied for them in real golf tournaments. A lot of other players have used their wives and girlfriends to caddie for them at The Masters par-3 event but that's not a real tournament. The most famous female caddie of all-time is Fanny Sunesson who was on the bag for Nick Faldo from 1990 to 1999. Fanny was Faldo's caddie for four golf major wins including two Masters. Fanny Sunesson also was on the bag for Henrik Stenson when he won the 2009 Players Championship. She also caddied for Sergio Garcia and Fred Funk in her career and Fanny Sunesson is in the Caddie Hall of Fame and now works as a golf coach with clients like Martin Kaymer.